At Foreign Minister Togo's request, Soviet Ambassador Sato tries to persuade the Soviets to mediate surrender negotiations. Soviet Foreign Minister Vyacheslav Molotov cancels the meeting, then announces that the Soviet Union is at war with Japan effective the next day. Meanwhile, leaflet dropping, and warnings to Japan by Radio Saipan begin (Nagasaki does not receive warning leaflets until August 10). Fat Man unit F33 is dropped in practice bomb run. 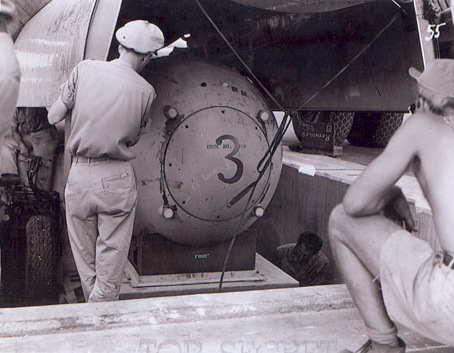 Assembly of Fat Man unit F31 with the plutonium core completed in the early morning. At, 2200, Fat Man is loaded on B-29 "Bock's Car".